Though most of you know I love old video games and love console systems, my actual favorite gaming platform is the PC. Just the quality of the games and the fact that they are much more cutting edge than any console can be as the hardware is evolving so rapidly. On the flip side though, it can be a great deal more expensive to keep up. 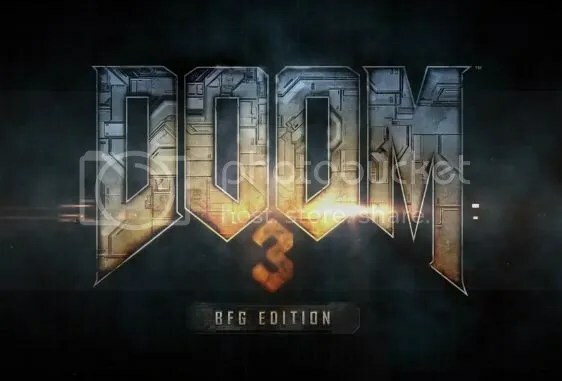 Regardless though, I love them and when I found out earlier in October that Doom 3 was going to be re-released in an all new re-mastered package, I got pretty excited. Though the re-mastering was really only apparent in the X-Box 360 version (as the original release was for X-box) I really didn’t notice a whole lot in that area for the PC version. But the package of Doom 3, Resurrection of Evil expansion and the never before released “Lost Missions” was well worth it to me as I’d never played ROE or the Lost Missions either. To top off this nostalgic trip, ID put all three of the original Doom games in as well, including their expansions. So for $30 they packed a hell of a lot of shooting fun into the package and I was grateful to take the trip back in time in such a cool new medium. That being said however, there were a couple of glitches that you would have thought might have been fixed before the release. For one, the game has to be played through STEAM, the third party game launcher that forces players to sign up in order to activate and play the game. I can see this for multiplayer games but to have to have an internet connection to play on your own really seems like a bit of loss of control kind of issue. I mean I see why they did it to help prevent piracy which I do admit is a big problem, but if the Internet is down or you have no connection to the net, there is no playing the game which I think isn’t fair. They do make it fun though by adding new achievement badges as you go so you’re not just playing to get to the end, you can actually earn rewards, however arbitrary they may be. The biggest issue I found though is that with some PC systems like mine, there was a massive drop in performance which by today’s standards shouldn’t have been there. Even with all the graphics options put to their lowest settings, the game was laggey, and jumpy and just not playable. Now my system more that beat out the recommended settings as the original game was over 8 years old and even the remastered edition wasn’t too demanding. Turns out there was some form of “post-processing” issue that there was no control for in the main options menu. Fortunately a STEAM member found out what it was and provided a simple fix that made the game run as smooth as ever. So anyway, that’s just my quick review of the game, but I also added a new page under the Guides tab that has the performance issue fix, all the cheats for the original Doom series and Doom 3 as well as 95% of the cabinet codes for Doom 3. Still working on ROE and the Lost Missions. Check it out here and have fun taking out the minions of Hell all over again! Personally I didn’t like Doom 3 (played it on PC years ago), nasties appeared literally from no-where and usually behind you, which wasunfair; the fact you didn’t strap the torch to your gun (as would in real life) to shoot and see at the same time in a dark room; and the general feel of the game seemed a real disappointment IMO. The original Doom or Doom 2 didn’t suffer from any of those issues and were more enjoyable to play as a result. The best of the genre in my view is Wolfenstein; the Jaguar version is better than the PC one (gasp!) although more limited in levels the enemies are better sprites by far. Haha, I don’t think fairness was much of a concern as much as it was to give a true 3D perspective from a dynamic angle. The flashlight (torch) was a big bone of contention though with a lot of people and the BFG Edition includes the ability to use the flashlight and fire a weapon at the same time so that compliant was fixed. I’ve never played a Jaguar before but I’ve seen the Wolf 3D version for it and I agree that it looks and plays great. Doom and Doom II will always be the flag ship for the genre though and to that I agree with fully!